Reasons why I am not troubled by the issues that trouble doubters, and hopefully lessen or eliminate those concerns. I think it’s important to approach these things with an open mind. Things aren’t always as they appear, and it’s easy to make false assumptions that lead to false conclusions. I learned a lot through taking a course in magic at a young age. Trick after trick, I saw the unexplainable play out right in front of my eyes. And each time, as the explanation showed up, I gained a greater appreciation for the craft. Sometimes I wonder what it would take to convince me today that a trick is real. I can't trust my eyes, or ears, in the face of a cunning illusion. Philosophers have tried to figure out what it means to really know anything. It seems the only thing you can really know at the most fundamental level is that there is such a thing as conscious experience. It makes sense to me that God would reach out to us at that fundamental level - at the core of who we are. That is where we know Him, not just about Him. I think the real question is, “what does God’s love and light mean to us when we feel them?” For me, faith is when our spirit feels God’s spirit and starts to remember things that defy worldly understanding. It is not the absence of evidence that defines faith, but the attraction of our spirit to things it doesn’t understand but that it knows and remembers. I do know Heavenly Father, and I love Him. And I know He loves you. That is why I am attempting to answer your questions as best as I can. One day, Joseph Smith will personally answer questions about him. I am confident his answers will completely satisfy all of us. We do not need to wait for definitive answers, however, before demonstrating that satisfying answers are possible, which should be sufficient to neutralize criticism. For more on this, see The Apologetic Proof Paradox. This article essentially presents a series of discrepancies, coupled with a request to reconcile them. My job, then, is not to prove that the answers I provide are true, but, rather, to show that my answers can reconcile the discrepancies (see link above). For this reason, you will find quite a few words like "may" and "might" in this article. Some may take that as a sign of weakness, but I don't need to posture my arguments - this is about logic and reason, not pretense. Online criticsm has helped fulfill the prophecy that Joseph’s name should be had for both good and evil among all nations. There are plenty of good things to be said about Joseph Smith, which are beyond the purview of this reply but which are available elsewhere. I think it would be a mistake to approach these concerns without presuming Joseph’s innocence. We are largely dealing with historical matters and circumstantial evidence against a defendant who literally had his day in court stolen from him by accusers, because they killed him. Occam’s Razor can’t settle the question of Joseph’s guilt or innocence, because non-believers are left with the circular “Joseph is probably guilty since he’s probably a false prophet,” while believers like myself expect opposition in all things, and the mere existence of that opposition proves nothing. In practical terms, I’m saying that the case against Joseph Smith is only meaningful if it can overcome the presumption of innocence. If it can’t, then wherein lies the conclusion? The 1769 version is evidently quite standard, and substantively the same as the 1611 version, so I don’t know that it is unique in a meaningful way (I could be missing something), but I agree that it contains the variations to which you refer. The source text of the Book of Mormon is ancient but the target text of the translation is modern; the ancient text does not contain English, presumably, and as such does not have the KJV variations we see in the target text. Since the plates from which Joseph translated would not have had the KJV variations/errors, I think it is reasonable to assume that the sections in the English translation which contain those came not from the plates but from the KJV Bible, indicating the KJV content in those passages was chosen over the corresponding content or lack thereof on the plates. In other words, not everything Nephi wrote was necessarily suitable for English translation. This could mean that Nephi had written a version of Isaiah aimed exclusively at a Mesoamerican audience, similar to Midrash or Targum, which had expired in usefulness (and could even cause confusion today) or resisted English translation. Nephi tells us (1 Nephi 9:5) that he doesn’t know why the Lord is commanding him to make the Small Plates. Perhaps if Nephi had understood that the Plates were for Latter-day use, he would have written exclusively for our day. We don’t need to know the exact reason, but other possibilities exist. We might not be ready for the version of Isaiah Nephi may have quoted and so it is being held back from us. Or, Nephi may have gone back and forth between quoting small portions of Isaiah and referring the reader to the Brass Plates for the majority of the sections he referred to – in which case Joseph may have substituted the KJV for the Brass Plates. All of this I think finds support in the use of Malachi in the Book of Mormon. Let's look at the context in the Book of Mormon, where Malachi is cited. 3 Nephi 24:1 tells us that Christ expounded the Malachi scripture. Then 3 Nephi 26:1 again tells us Christ expounded it. However, we do not get to see Christ expounding on the content of Malachi. Instead, we see only the Malachi scripture (in King James Version), indicating that Christ's expounded version of Malachi is being kept from us and replaced with the KJV. This makes sense in the context, because Mormon tells us he is commanded to not write the things Christ spake (verse 11), saying that the greater things will only be made manifest to those who believe the lesser things (verses 8-9), and that the reason for this is to try the faith of the people. So, if the people were willing to receive a different version, it might have been given to them. But it’s important to realize that the KJV of Isaiah is accepted scripture, human error notwithstanding. So there’s nothing inherently wrong with Joseph using the KJV of Isaiah. Human language is flawed, and if the Lord chooses to use human language then He expects it to be flawed and expects us to turn to Him to understand. Joseph did say the Book of Mormon was the most correct book on earth, but I think it’s pretty clear that he was referring to the teachings found in the book, not punctuation, grammar or things of the like. One might ask why Joseph didn’t see or correct the variations/errors when he made other changes to the KJV of Isaiah. To answer this, we would probably need to know what criterion he was using to make changes. He probably was not trying to retranslate Isaiah. Instead, he may have been looking for specific types of changes to make. It is impossible to judge Joseph without knowing what Nephi had written, what Joseph understood, what Isaiah intended, and what the Lord said. They are part of the translation. The distinction you make between italicized and non-italicized words is unnecessary, I think, since they are both chosen by translators and both necessary to represent the source language in target language. Consider that if a child asks what the word “huge” means, someone might explain that “huge” means “very large.” The word “very” does not mean “huge,” but it is part of the translation. Here, the word “very” would be italicized if we were following the convention of the KJV. For the essential answer to this question, I would refer you to the answer to Issue #1, to which I would add that there is something to be said for standardized usage, i.e., the scriptures talk about the importance of being “plain” to the understanding of the children of men (1 Nephi 13). So if the KJV were to translate “huge” as “very large,” then it would not be helpful for Joseph Smith to change “very large” to “enormous” just for the sake of changing it. It creates confusion without adding clarification. You’ll notice that the Joseph Smith Translation of the Bible is shown in footnotes in the LDS KJV Bible. The JST is a resource to help clarify, and it doesn’t get in the way of standardized usage of the KJV or add confusion. Also, the Lord may have only intended the JST to supplement and inform rather than replace the KJV, which serves a sacred purpose and is accepted scripture though acknowledged to be imperfect. The JST may reflect more the intent of the ancient writers and not especially the word choices they used. The Sermon on the Mount passage in 3 Nephi is quite possibly substituted in place of more specific doctrines not revealed to us, in which case it represents the portion of what Jesus taught the Nephites which overlaps what Jesus taught in his mortal ministry. See answers to Issue #1 and Issue #2. Joseph Smith may have done more if he had lived longer. The discrepancy you present could be explained as Joseph prioritizing the Book of Mormon translation ahead of the Bible translation, and thinking of the Isaiah, Malachi and Sermon on the Mount passages in the Book of Mormon as being part of the latter undertaking. During the Carter Administration, Saturday Night Live aired a skit about the President growing into a giant, following a visit to a nuclear power plant. Only a handful of people were aware of the President’s condition. During a Press Conference, a reporter asked if the President was 100 feet tall. The answer came back: “No! Absolutely not!” Then someone asked, “is the President 90 feet tall?” This time, the answer came back: “No comment.” The willingness to answer one question but not the other was itself an answer. I am reminded of this skit when I recall an exchange I had with Dr. Simon Southerton. He showed a willingness to answer some of my questions, and then I asked him in a straight-forward way how diluted my Scandinavian DNA would need to be in order for it to avoid detection. His response surprised me. He essentially said that he didn’t want to give me information that could be used to defend the Book of Mormon. Clearly, his unwillingness to answer that specific question is itself an answer. His response wasn’t actually about hard science, but about his personal beliefs. I am mentioning Southerton because many people evidently rely on his interpretation of data in order to formulate their own conclusions. Southerton is quoted as saying, for instance, that “Lehi’s descendants multiplied exceedingly and spread upon the face of the land.” However, that is not what the actual text of the Book of Mormon says. It says the “Nephites” multiplied exceedingly (Jarom 1:8), but it contains no reference to descendants, ancestry or biological relation. Dr. Southerton says a group as small as the Lehites should be detectable using modern methods, however his actual scenario upon which he relies requires that the biological descendants of Lehi first grow in number exponentially, and only then mix their DNA with the native population. Contrast Southerton’s analysis with the fact that, under Joseph Smith, the Church gained about 10,000 converts in the first ten years. If we permit Nephi the same conversion rate of the Native population which science tells us was here in the Americas, we then see how the Nephite people could quickly lose their association with Lehite DNA (not that Lehite DNA started out as uniform itself). This is where an interesting dynamic develops, making the Nephites and Lamanites comparable to the situation we find in Theseus’s Paradox. Theseus’s ship, in Greek Mythology, was preserved for many years. As parts wore out, they were replaced. Eventually, all the parts had been replaced, which raises the philosophical question, “can it still be called Theseus’s ship?” Similarly, we could ask if “you” are still “you” after all the atoms in your body are eventually replaced over time. When it comes to the issue of Lamanites, how much of Laman’s own DNA would you propose is necessary? Remember, the Book of Mormon people are not identified in terms of biological relation, but spiritual relation. To God, all things are spiritual. Even if all the “original” DNA were replaced, Nephites would still be Nephites. We are not DNA – it is something we have, not something we are - we are human beings, with souls. Are we to expect, then, that any “original” DNA from the Lehites exists in Native American people today? How much, Jeremy, would you expect to find? I would not expect to necessarily find any, and let me explain why. Selective Bottleneck Effect is the idea of combining a genetic population which has just experienced Population Bottleneck and has not had a chance to regrow its population on its own, with a genetic population that was unaffected by the Population Bottleneck event. This magnifies the dilution of DNA. Population A (1,000 people) and Population B (1,000,000 people) are genetically different. A Population Bottleneck occurs, affecting both populations, decimating each population to 100 and 100,000, respectively. The populations then integrate, resulting in a composite DNA of 1,000 parts Population B DNA to 1 part population A DNA, which is the same ratio as would have existed had the populations integrated without a Population Bottleneck. Population A (1,000 people) and Population B (1,000,000 people) are genetically different. A Population Bottleneck event affects only Population A, decimating the population to 100. Population A and B then integrate, resulting in a composite DNA of 10,000 parts Population B DNA to 1 part Population A DNA, which is a ratio 10 times greater than it would have been had the populations integrated before a Population Bottleneck. Population A (1,000 people) and Population B (1,000,000 people) are genetically different. A Population Bottleneck event affects only population A, decimating the population to 100. Population A integrates with 100,000 people from population B, resulting in population C, which has 1,000 parts Population B DNA to 1 part Population A DNA. Another Population Bottleneck event occurs, affecting only Population C, decimating the population to 10,000. Population C then integrates with the remaining 900,000 people from Population B, resulting in a composite DNA of 90,000 parts Population B DNA to 1 part Population A DNA. As demonstrated in these scenarios, Population Bottleneck events affecting only Nephites and Lamanites could have greatly increased the diluting impact of integration with surrounding Native populations. This would also apply to integration following smaller bottleneck events, such as each time the Nephites and Lamanites fought and decreased one another’s populations. Over the course of the Book of Mormon, this effect could add up. And, of course, the great destruction in 3 Nephi and the great destruction in 4 Nephi not only would have been Population Bottleneck events causing tremendous loss of DNA in their own right, but they also may have led to Selective Bottleneck Effect. Consider the state of the people after Christ visited them. Imagine the effectiveness of missionary work by a nation of personal witnesses to our Resurrected Savior, having personally been ministered to, and imagine the corresponding integration between these people and their converts – converts consisting perhaps of Native peoples who had not previously been contacted (consider how long it took the Nephites to discover the people of Mulek, and how much longer it would take to discover Native populations which had not yet migrated to Mesoamerica or which the Nephites had not yet scouted). Then consider the end of the Nephite civilization. The remaining Lamanites had plenty of time to explore the Americas and integrate with Native populations, which would make the Lamanites among the ancestors of today’s Native American populations, as the introduction to the Book of Mormon states. Remember that we are dealing with a very important letter here, and yet Emma (years later) told their son that Joseph “could neither write nor dictate a coherent and well-worded letter.” Joseph was literate, but writing did not come easy to him. Accordingly, one of the routine duties of Joseph's scribes was to adjust his grammar and phraseology to conform to professional standards. In the process of them performing that duty, some meaning was inevitably lost. I feel like I can kind of relate to Joseph Smith. Although I do write reasonably well, I don’t really understand the rules of how I’m supposed to write. I just do it intuitively as best as I can. And in particular, I have a difficult time reading. I find it hard to read and think at the same time, which obviously makes it difficult to think about things I’m reading. What we most likely have in the Wentworth Letter, then, is a re-wording by scribes of Joseph Smith’s ideas which he wanted to convey. And, importantly, the letter was not intended to expose everything Joseph Smith knew. Instead, the Wentworth Letter was intended to be a basic introduction to the Book of Mormon and to the Restored Gospel. For instance, the letter mentions a “first settlement” in Ancient America. But we know from Joseph’s earlier teachings that Adam-ondi-ahman predates Jaredite settlements on American soil. Does this mean Joseph forgot about Adam? Of course not. The context of the letter is limited. It is not about everything that has happened on this continent ever. The context is of a particular history – a history that started when the Jaredites arrived. The broad, sweeping language is probably the work of the scribes, who were evidently drawing on Orson Pratt’s 1840 Pamphlet. For instance, Pratt wrote “early settlement,” which was changed to “first settlement” for the Wentworth Letter. I imagine the scribes thought nothing of it doctrinally, but they may have thought the word “first” is more precise grammatically and therefore would sound more professional. God allows His servants to make mistakes, and expects us to do the same. It’s important to remember also that the audience for whom the Wentworth Letter was initially written was a society that had no problem crediting Europeans with the discovery of America, despite the fact that millions of people were already here when the Europeans arrived. Even the erudite Noah Webster, in his 1838 dictionary, says America was “first discovered by Sebastian Cabot.” It’s important, therefore, to remember that Webster was looking at things in terms of the European history of America, just as the Wentworth Letter was looking at things in terms of the Jaredite/Nephite history of America. The European view of who “first discovered America” didn’t stop the Europeans from integrating with the pre-existing Native population, just as the Jaredites and Nephites may have done. And, of course, there’s the question of how much Joseph knew. I’m inclined to think Joseph Smith knew more than we realize, but I’m also inclined to think the details on things he didn’t “need to know” were probably hazy. Joseph did have Angels visit him, but consider the fact that Jesus Christ Himself taught his disciples in Jerusalem, and He didn’t reveal everything. Regarding the inhabitants of America, Jesus only told them He had “other sheep” to visit and minister to. We need not suppose that Jesus told the Apostles much more than that. Especially, if they didn’t ask. Was it not the same way with Joseph Smith? Certainly the Angels Joseph saw knew he would need to be baptized by one holding Priesthood authority, but they didn’t tell him until the time was right, and he asked concerning baptism. So the fact that he had Angelic visitations does not tell us how much he knew. As far as the use of the word “race” in the letter goes, it speaks of the race that came from Jerusalem as being “principally Israelites of the descendants of Joseph.” We should note that Israelites have always included converts of any genetic race. When Christ visited America, everyone in the area became converted or was already a member. And by that point, essentially everyone in the area would be able to trace their ancestry spiritually as well as biologically to Lehi, regardless of how much, if any, of Lehi’s DNA was in their genetic makeup. In other words, they would have all been “descendants of Joseph” at that point. Lastly, I just have a pet tangent I’d like to go down. I want to note that when the letter says the Jaredites “were destroyed,” that could simply mean the name and culture came to an end, which does not necessarily preclude the idea that former Jaredites had at various points branched off and went their own way, becoming “separate peoples” although still inhabiting America. I had never previously considered the significance of those words: "a great many thousand years." This could mean a very large number of years, potentially. At first, the idea may seem to contradict other scripture. For instance, you may wonder how this squares with D&C 77:6, so I want to take a moment to suggest Jeff Lindsay's excellent postwhich sheds light on that verse of scripture, and also thisFairMormon article. And, of course, I realize the scriptures give us some genealogy concerning who begat who, but this could easily be a record of notable names rather than of every descendant in a lineage. For instance, I am a "son of Abraham," yet Abraham lived 4,000 years ago. The New Testament starts out in Matthew with the words, "The book of the generation of Jesus Christ, the son of David, the son of Abraham." Or, in reverse it could be said, "Abraham begat David, David begat Jesus Christ." I realize the Bible says that specific people lived certain numbers of years and begat other specific persons. But in light of the fact that we may say David begat Jesus, it may be the case that the age associated in the Bible as being when a person begat another, may actually refer to the lineage from which their said descendant came. For instance, we might ask at what age David begat Jesus. The answer would be the age at which David begat Solomon, from whom Jesus came. This might not feel like appropriate terminology in modern-day English, but then again it also would not "seem" appropriate to us today to say that Jesus was the son of David, or that David was the son of Abraham, and thus to omit everyone in-between. So it would be very hasty for us to assume that the Bible is telling us that a person was born at or even close to the time they are listed as being "begat." For those interested in a more thorough treatment of this issue, including what we are to understand by the word "begat" (the Hebrew word, "yalad"), click here. For information on the Hebrew word "ben," click here. I think it could be insightful to try reading the first few books of the Book of Mormon with the idea that the land was inhabited (perhaps sporadically at the time, with cluster populations) when Lehi arrived. As you do so, consider a few things. First, it is true Natives are not explicitly referred to “as” Natives. But Nephi didn’t know God’s purpose in commanding him to make the small plates. He probably wrote the small plates for his people, which may have mostly been Natives, telling them the story of how the gospel was brought to them. In that context, we wouldn’t expect him to refer to them as Natives, but simply as his people. They would recognize that phrase as a reference to them. Consider, for instance, 2 Nephi 5:33, which reads, “And if my people desire to know the more particular part of the history of my people they must search mine other plates.” In English, this repeating of the words “my people” seems somewhat awkward, perhaps indicating a connotation in the original language was lost in translation. In this verse, Nephi makes clear he is writing for his people, but he speaks of them and to them at the same time. At other times, references are made to “the people” in a more general sense, which may indicate that they are not necessarily the people of Nephi. Again, phrases like “the people” are an English translation of whatever was actually said, and any cultural understanding of the phrase used could be lost in translation. For instance, if the word “aloha” were translated into another language, it would simply be translated as a greeting – such as “hello” in English – but in Hawaiian language it means so much more, yet all of its special connotations would be lost in translation. Again, the cultural and Native connotations of what Nephi actually said would likewise be lost in English. Second, when someone adopts a child, we wouldn’t expect them to refer to the child as their “adopted child,” but simply as their “child.” Likewise, we wouldn’t expect Nephi to refer to those without Lehite blood as different. They were all the “people of Nephi” – those adopted into the house of Israel could rightfully claim membership in the “branch” that was broken off when Lehi left Jerusalem. Converts were all numbered among Lehi’s seed (2 Nephi 10:18-19), regardless of their gentile background. It is in this sense that Lehi inherited the land – this is who his progeny would be, and where they would flourish and have an opportunity to inherit the land for Israel. Third, as I recently pointed out, The “skin of blackness” mentioned by Nephi (2 Ne 5:21) - translated at other times into English as “very dark” or “dark” - may have actually been understood by Mayans according to extensional meanings represented in their language - and not physical coloration. ...the significance of the logogram for the color black extends beyond the notion of color into a broader range of meanings that includes hollow objects … The association of the term ihk with the notion of emptiness is indicated by the presence of dark or cross hatched spots on representations of objects, which are not necessarily black, but almost certainly hollow. This opens up some interesting possibilities. Could “emptiness” in the context of skin mean lack of clothing? Or garments? As far as literal darkness goes, lack of clothing would certainly cause darker skin under the hot Mesoamerican sun. Interesting possibilities. Tokovinine goes on to state that when Mayans described objects and beings as a certain color, they usually didn’t mean the object or being actually was the color: "Classic Maya narratives’ fascination with extensional meanings … cautions us against automatically linking every instance of basic color terms in writing and imagery with color properties of objects or beings. The actual evidence suggests that, more often than not, this was not the case." All of this is consistent with the fact that Joseph Smith changed the word “white” to “pure” (2 Nephi 30:6) in the 1840 edition of the Book of Mormon, before race was an issue. Nephi may have written a word for the color “white,” intending to convey a meaning other than color, but which in English is just taken as reference to the color. This explanation is also consistent with the Book of Mormon telling us the mark on the wicked is something they do to their own selves (Alma 3:18-19). And, of course, the Native skin color of people living in the Americas when Nephi arrived was probably a beautiful brown or dark brown, having nothing to do with the mark the wicked placed on themselves. As the story goes, during an 1860 debate at Oxford, concerning evolution, Bishop Samuel Wilberforce asked Thomas Henry Huxley which side of his family had monkeys – was it his grandmother’s side or his grandfather’s side? The caricature painted with that question is pretty funny. But it is not a logical argument, and does nothing to refute or even address evolution. Laughing at something doesn’t make it false. Personally, I think if I didn’t know about the sun I might even laugh at the idea of a giant, exploding gaseous sphere on a voyage through space – but I don’t laugh at it because I am familiarized with the notion. It’s difficult to avoid direct evidence of it every day. It literally hits you in the face, in the form of radiation spat out at you by those exploding gases. Evolution should be taken seriously, regardless of what side one takes on the issue. And organic evolution isn’t the only type of evolution. 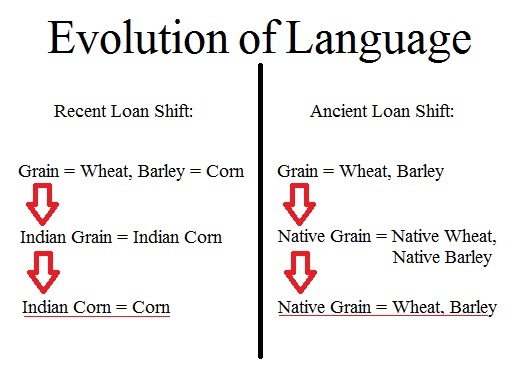 Language also evolves. One of the ways it evolves is through loan shifting. 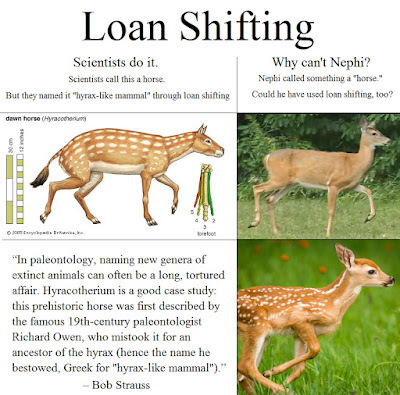 Making fun of loan shifting, instead of offering a serious response, is just as intellectually evasive as making fun of organic evolution. I’m hoping, then for serious arguments to be made against the loan shift idea. So far I haven’t seen any, ever. They say a picture paints a thousand words, so here are some thoughts to consider. On the left is a horse skeleton, on the right is a tapir skeleton. No matter how many millions of years ago Eohippus lived, the relevant and remarkable fact stands that scientists today call it a “horse.” Google “earliest known horse” to see page after page of scientific books and articles refer to Eohippus and Sifrhippus as “horses.” Sources include everything from Yale University to the Richard Dawkins Foundation for Reason and Science. “But,” someone might protest, “scientists have a reason for calling Eohippus a horse!” Okay, but I’m sure Nephi also had a reason for calling something a horse. If it were me, after years of not seeing horses, the tapir would probably seem more and more reminiscent of a horse. The point is, an animal doesn’t need to look very similar to a modern horse to be called a horse. If Eohippus is considered a horse by modern science, why is Nephi not allowed to call a deer or a tapir a horse ~600 BC? Even if you believe Nephi was misguided, that just places him in the company of all the scientists who have made taxonomy classifications which later needed to be changed. Another argument someone could make is that Eohippus is not a “modern” horse and therefore doesn’t really count. 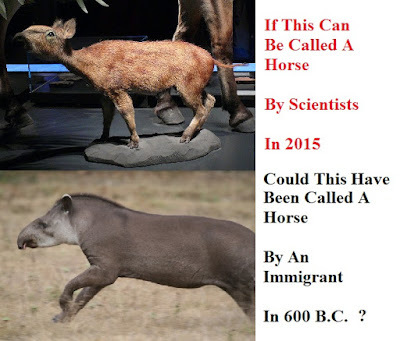 Okay, but why is it still called a horse? Is it done for convenience and simplicity? If you say Eohippus is not actually a horse, all you are really saying is that the scientists are loan-shifting. Why would Nephi not be allowed to do the same thing? It is true Eohippus is related to the “modern” horse, but the tapir is also related to the “modern” horse. Eohippus is an ancestor, while the tapir is a close cousin – in fact, it is the closest cousin to the family of horses, which includes zebras, donkeys, etc. Why would loan-shifting be allowed in one case, yet banned in the other? Of course, all four species of tapir that are native to the Americas are cousins of the horse, but they are also related to other horse-like animals mentioned in the Book of Mormon. So, different species of tapir could have been assigned different names in the Book of Mormon. 3 Nephi 3:22 tells us “they had taken their horses, and their chariots…” And then what did they do with their horses and chariots? Did they ride like the wind? No. They took their horses and chariots “…and did march forth by thousands.” Horses and chariots are simply possessions they took with them, along with “cattle, and all their flocks, and their herds, and their grain, and all their substance.” No indication anyone rode a horse, only marching is mentioned as a means of travel. The book of Ether actually goes out of its way to say that horses were among the less useful animals. Ether 9:19 says there were “horses, and asses, and there were elephants and cureloms and cumoms; all of which were useful unto man, and more especially the elephants and cureloms and cumoms.” Why would Joseph Smith, or anyone else in his time period, put horses in a “less useful” category, when they were the most usefulanimal to man in 1830? Do you know of any better explanation than loan shifting for why the Book of Mormon people always walk, rather than ride horseback? For that matter, can you think of any other explanation for this? Did Joseph intentionally leave out horse travel? Did Joseph intentionally fabricate horses that are too weak to carry people? Was it an oversight? “Horse” is a word Joseph used on a daily, if not hourly, basis in his life. For Joseph, horses were the primary mode of travel from town to town as well as living pets that needed to be taken care of and cleaned up after and loved. If the Book of Mormon is a work of fiction, the failure to mention people riding on horses would be like an auto mechanic writing a novel set in 2015 and mentioning cars but then forgetting about them and having everyone walk long distances instead of riding in the cars. The point here is that the plain meaning of the text connotes a type of animal people do not ride on. And someone called it a horse. Since Nephi, having come from the Old World, could have called it a horse at least as easily as Joseph Smith could have, the word horse in the Book of Mormon is not a true anachronism. Carl Linnaeas, the founder of modern taxonomy, classified the tapir as a type of hippopotamus, “Hippopotamus terrestris.” This was over 2,300 years after Nephi lived. Needless to say, a tapir is a much closer relative to a horse than it is to a hippopotamus. The tapir, horse and rhinoceros constitute the order Perissodactyla. Speaking of the rhinoceros, Linnaeas put the rhinoceros in the order Glires, together with rodents and rabbits. And, speaking of ancient prophets being criticized for how they classified animals: for those who might criticize Moses for lumping bats in with a list of birds (Leviticus 11:13-19), you may find it interesting to know that Linnaeas classified bats as primates, which they are not. We need not suppose that the first time Lehites saw a tapir they directly called it a horse. Rather, they may have initially compared it to a horse. They may have even called it “long-nosed horse.” This is the process of scaffolding. It involves a familiar name being applied to a new item, prefaced with a qualifying word or words which distinguish between the new and original item. Eventually, the qualifying word drops, leaving only the familiar name. In this case, people would start calling the “long-nosed horse” simply “horse,” because there are no real horses around to contrast it with and so the qualifying words aren’t necessary. We see this happen in real life all the time. For example, the New Testament mentions “corn.” But the “corn” Americans think of was unknown in the Old World. The word “corn” was an Old World name for grain. When travelers came to America, they referred to maize as “corn” but qualified it with the word, “Indian.” It was known as “Indian grain,” then “Indian corn.” Then, being separated from their homelands, over time they dropped the qualifier ("Indian") and began to refer to “Indian corn” as simply “corn. Had Nephi instead gone to Asia, he could have encountered the pug. What would we allow him to call pugs, and on what basis? The key here is not that a pug looks like any dog he had previously encountered, but the idea that the pug could be a strange new type of dog he had not previously encountered. Using that reasoning, could we suppose that Nephi mentioning domesticated dogs in Asia might be a reference to pugs? Now, we wouldn’t know for sure if he was referring to pugs, but would a pug be a valid candidate? If so, then why can that same reasoning not be applied when we consider what animal Nephi referred to as a horse in America? Some might ask why Joseph Smith did not “correct” words in translation. But consider cows, another alleged anachronism. We might imagine the Nephite writers were equating cows with bison. The translation conveys their intended meaning. If Joseph had translated it as “bison,” we would have missed the writer’s intention and lost a level of richness and nuance in the text. Similarly, if Joseph had substituted the word “America” in place of “the Promised Land,” the experience of the writers would be lost. The role of translator can be confusing to those on the outside who don't have access to the original intent of the source. I don’t think a translator should change words because they feel the original writer was wrong to use them. For instance, a German word for horse is pferd; if I'm translating a document from German into English, and the original writer is clearly talking about a cow but calls it a pferd, it would not be my place to render the word “pferd” as “cow.” Instead, I should render it as “horse,” even if I know that's incorrect, especially if I know the original writer intentionally called it that. Two animals, “cureloms” and “cumoms,” are unknown. So indeed it appears Joseph did not see his role as correcting the source text, only representing it in the target language. Chariots are mentioned, but only after the Lehites had spent hundreds of years in the Promised Land and would have had only a vague idea of what a chariot was. I imagine the Brass Plates probably had no direct explanation or description of “chariot,” and certainly no pictures. The people would have relied on intertextual clues. They could have adopted the phrase, “horses and chariots” from the Brass Plates, and incorporated it into their own vernacular, perhaps applying it to Native customs that fit the intertextual clues – for instance, laden animals accompanying people on journeys. As I previously mentioned, 3 Nephi 3:22 tells us “they had taken their horses, and their chariots…” And then what did they do with their horses and chariots? Did they ride like the wind? No. They took their horses and chariots “…and did march forth by thousands.” Horses and chariots are simply possessions they took with them, along with “cattle, and all their flocks, and their herds, and their grain, and all their substance.” No indication anyone rode a horse. Only marching is mentioned. Thus we see how important it is to consider the Nephite experience in the context of their history, their records and their sentiments. They branched off and evolved separately from the rest of the world, and we should not be surprised but should expect to see the evolution of terminology. Nephi brought with him from the Old World a knowledge of smelting, including steel production, and taught it to his people. This does not mean a massive steel industry existed. In fact, Nephite steel is not mentioned at all in the Book of Mormon after 400 B.C. The confusion over this issue results from a reference to steel swords, causing some to imagine that steel had “really taken off” and caused the Native people to replace their old ways. I don’t make that assumption and I don’t see why anyone would see a compelling need to do so. Nephi patterned his construction of swords “after the manner” of the sword of Laban. And the sword of Laban had a blade of “precious steel.” So, as the argument goes, Nephi’s swords had to be made of steel. I, however, would challenge the validity of the argument. First, what about the hilt? Are we to believe Nephi made all the hilts on his swords out of solid gold? The hilt on the sword of Laban was solid gold. If Nephi had to use steel for the blades, did he have to use solid gold for the hilts? And are we to assume all the swords made over the course of Nephite civilization had hilts of pure gold? If not, then on what grounds would we be required to believe and defend the same thing about the “precious steel” portion of the sword? And remember what I said about scaffolding. We can’t know what “precious” steel meant to Nephi and why he qualified it with that word, as opposed to simply “steel.” He also mentions “fine steel” with respect to his bow. What was the difference between the types of steel he was referring to? One possibility I personally find interesting to think about is that “precious steel” may have been similar to a diamond knife, having sharp “precious” stone fragments protruding from a base (of course this could be replicated in Mesoamerica with obsidian). Any clues what “precious” meant to Nephi? Yes. He uses it in reference to Solomon’s temple, i.e., built of “precious” things. So, we can see a bit of a parallel here between Solomon’s temple and the sword of Laban. The sword of Laban’s hilt made of pure gold is again consistent with Solomon’s temple. And just as Nephi patterned the construction of his swords “after the manner” of the sword of Laban, so he patterned the construction of the Nephite temple “after the manner” of Solomon’s temple. And, as Nephi explains, the temple was not built “of so many precious things; for they were not to be found upon the land.” And yet, despite not having the right materials, Nephi assures us “the manner of the construction was like unto the temple of Solomon.” So, Nephi simply didn’t have to use the same material. As for the single mention of Jaredite steel swords (Ether 7:9), which were made by Shule, it’s important to remember that Joseph Smith was not translating the Jaredite record but translating a Nephite abridgement of the Jaredite record. What Shule produced to make the swords with isn’t necessarily something Joseph Smith would have described as “steel,” merely something Moroni was willing to equate with his understanding of steel. Suppose I encounter two people in one small neighborhood who look very similar. I might reason that the chance of two people living so close and randomly looking so similar is very, very small. I might further reason then that the similarity in appearance is probably not actually random. Should I next reason that one of them altered their appearance to try to look like the other? Not so fast. I would be forgetting that the two people might have come from the same source, i.e., the same parents, and inherited their appearance from that common source, rather than copying from each other. Likewise, we should expect names that stem from the same linguistic heritage to have some similarity. As you know, 7 of the 20 place names on your Vernal Holley list are in the Bible - and these tend to also be the best matches on the Holley list (incidentally, regarding the town of Alma on the Holley list, my understanding is that Myron Rough and John Longcore were the first settlers, in 1833. Unless I’m missing something, which I very well could be, I don’t think it should be on the list). Since those names are from the Bible, and since the Lehites came from an Old Testament setting, I believe the place name correlation represents a convergence of authentic ancient language. There is an obvious parallel between the Lehites and the Lost Tribes of Israel. 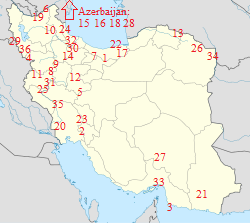 2 Kings 17:6 tells us they were captured and taken to Assyria, including the “towns of the Medes.” This means they were taken to what is now the northwest part of Iran, by Azerbaijan. And, interestingly, the language in that region independently produces the same names as those found in the Book of Mormon. Notice how the vast majority are in the northwest, where the Lost Tribes were expelled to. You may be interested in reading about the Mountain Jews and the Bukharan Jews, both of whom have ties to Persia and both of whom trace their ancestry to the Lost Tribes. I had no idea before I researched this. As I mentioned earlier, I believe the town of Alma should be off the Holley list, but if you disagree I am open to being corrected. And for reasons made apparent in the Iran illustration, I believe the Biblical places – Antioch, Boaz, Jerusalem, Jordan, Noah Lakes, Sodom and Shiloh really don’t belong. I would add to that list Sherbrooke, Hellam, Rama and Lehigh because their alleged counterparts Shur, Helam, Ramah and Lehi are Biblical names. I suspect Biblical names are much more likely than most others to have their sounds and spelling copied, and if we substituted Biblical names not found in the Book of Mormon for ones which are, then repeated the Holley method, we would have a similar result to the one Holley came up with. And, of course, that would not prove anything. What can the Smithsonian Institute and National Geographic Society tell us? A great many things about archaeology, yes. But nothing that refutes the authenticity of the Book of Mormon. If their letters constitute the big scientific response to the Book of Mormon, where are the peer-reviewed journals? Where are the pages of research that went into formulating their conclusions? Where is the intertextual analysis demonstrating that they made a serious attempt to even understand the claims of the Book of Mormon? This is not a criticism of these good folks… I’m merely asking why anyone would appeal to them as an authority of a subject they never studied? Most organizations are not equipped to assess the Book of Mormon as an English translation brought forth by the Gift and Power of God. The real question to ask is, how would the organizations have reacted to a strictly secular account of the Nephites, recorded on gold plates and discovered in Central America by archaeologists in 1830 and deciphered in 2015? They would be excited to learn about this extinct race of people. The mention of horses would be a case study in the evolution of language, and, yes, NHM would be counted as hard evidence of authenticity. And most importantly, they would not have the flawed expectations they currently bring to the table, about direct evidence – because, they would take the time to understand the actual stated context of the book. The Book of Mormon tells us very little about what the Lamanites were up to on their own. It is a Nephite record. about direct evidence – because, they would take the time to understand the actual stated context of the book. The Book of Mormon tells us very little about what the Lamanites were up to on their own. It is a Nephite record. The problem is, the Nephites were systematically exterminated by the Lamanites. As far back as Enos, who tells us the Lamanites swore that if it were possible, “they would destroy our records and us, and also all the traditions of our fathers” (Enos 1:14). This goes way beyond one nation simply conquering another. It even goes further than book burning. The Lamanites swore to destroy every trace of the Nephites, their practices, their traditions, etc. And that means the Lamanites had different practices. Things we wouldn’t know to look for. Did the Lamanites keep the Nephite records? No, they swore to destroy them. Did they keep city names? No, they would have changed them. Did they tell the history of what actually happened? No, they rewrote it. You mention Rome, and the evidence we have of Roman occupation. But how much evidence would we have today, if another occupying force swept through in 400 A.D., systematically killed all the Romans, renamed Roman cities, destroyed all Roman records, rewrote history and imposed their own culture? And, 400 years prior to that, the Roman Empire had been decimated by a massive earthquake, after which the rubble was picked up and cities rebuilt by survivors? And, over 1,000 years after, 90% of the people in what would be the land no longer known as Rome were killed and the vast body of their written records was destroyed by Spanish invaders? Rome merely fell. The Nephite civilization was destroyed.